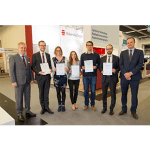 This year’s Eckert & Ziegler Abstract Award went to five nuclear medicine specialists from Germany, Sweden and The Netherlands at the congress of the European Association of Nuclear Medicine (EANM) in Vienna. The prizes were awarded for research work in the fields of oncological diagnostics. “With its Travel Award, Eckert & Ziegler assists young scientists in making their research results in the field of medical imaging available to a broad public,” explained Dr. André Heß, Member of the Executive Board of Eckert & Ziegler AG and Head of the Radiopharma Segment. Eckert & Ziegler Strahlen- und Medizintechnik AG (ISIN DE0005659700), with approximately 760 employees, is one the world’s largest providers of isotope technology for radiation therapy and nuclear medicine.